It’s said that a person’s eyes act as windows into their soul. Many cultures believe you can learn a great deal about someone through the size and shape of their eye. In fact, cultures all over the world practice medicine, gather information, or understand a person through the shape of their eyes. They believe that they eye reveals an infinite amount of personal information, and they aren’t to be ignored. Everything is taken into account when it comes to understanding a person’s eyes. This includes size, shape, color, slant, and even the distance between someone’s eyes. 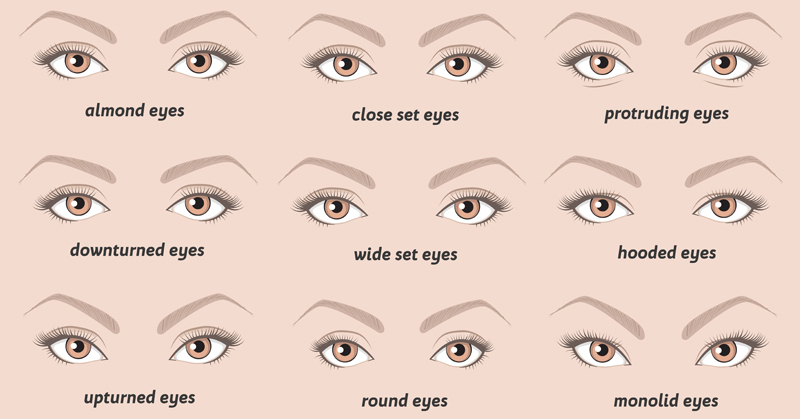 Take a look at the descriptions below in order to find out what your eyes reveal about you. For those of you who have almond-shaped eyes, you have charisma and flair, as well as a great compassion for others. Despite your ability to remain calm in a variety of situations, you often let yourself become wary of new experiences. You need to remember that taking chances can be a good thing. For those of you with round eyes, you’re creative and imaginative. Your mind is your escape from reality, and you’re prone to daydreaming. Instead of using logic to make decisions, you let your emotions and feelings steer you in the right direction. Although some people might see you as impractical, others will flock to you. People with deep-set eyes tend to hide themselves from others; they’re private and can seem intense at times. Although they don’t let people in very easily, they do have a romantic streak and will get to know someone on a very deep, spiritual level. They tend to observe rather than interact. People with prominent eyes are sensitive and friendly, but they are also prone to over worrying. It’s easy for these people to maintain close relationships, which makes them an ideal family member or extremely close friend. They are found to be highly approachable and easy to relate to, but they can seem pessimistic. Having large eyes means that you’re passionate, receptive, open, and creative when it comes to your personality. You can feel your own emotions incredibly deeply, as well as the emotions of others. Passion tends to rule your direction in life rather than logic, and you won’t be talked into doing something you don’t want to do. However, you tend to trust people too easily, which can be a fault. Having small eyes means you’re the opposite; instead of letting emotion or passion drive you, you use logic to make every decision. You possess a high intelligence, which means people come to you with their questions. Instead of focusing on the big picture, you analyze the details before focusing on a wider perspective. People with close-set eyes are traditional. They have a keen interest in history and culture, and their values and upbringings mean a great deal. Change is scary to these people, and they have a hard time living in a world that doesn’t remember where it came from. These people don’t go with the flow, and they feel most comfortable in a disciplined setting. People with wide-set eyes are the exact opposite; go with the flow is their mantra in life. These people remember their pasts, but they don’t let the past dictate who they are in the present, and especially not who they’ll be in the future. These people enjoy getting out of their comfort zones and seeing the world through a new lens. Downward slanting eyes means you’re dependent. You enjoy staying close to the people in your life whom you love, and you rely on them for stability. Your timid nature and pessimism makes it hard for people to enjoy your company at times, but it doesn’t change the way you feel about people. You care deeply for people and your relationships, which means you keep friends for a long time. Upward slanting eyes tends to mean the opposite. Instead of being timid and dependent, you’re ambitious and driven to the extreme. When you have a goal in mind, nothing and no one can stop you from accomplishing it. People enjoy being around you because you’re well rounded, fun, and exceptionally witty. You can find an opportunity no matter where life takes you. none of these pertain to me!